Sweater weather is finally here and we are ready to rock with 9 lip-smackin’ apple recipes! There’s no better way to start the fall season than by cooking up some eats around the campfire. Apples are especially delicious this time of year, which is why we’ve tried to include all the sweet, crunch-tastic recipes we know. 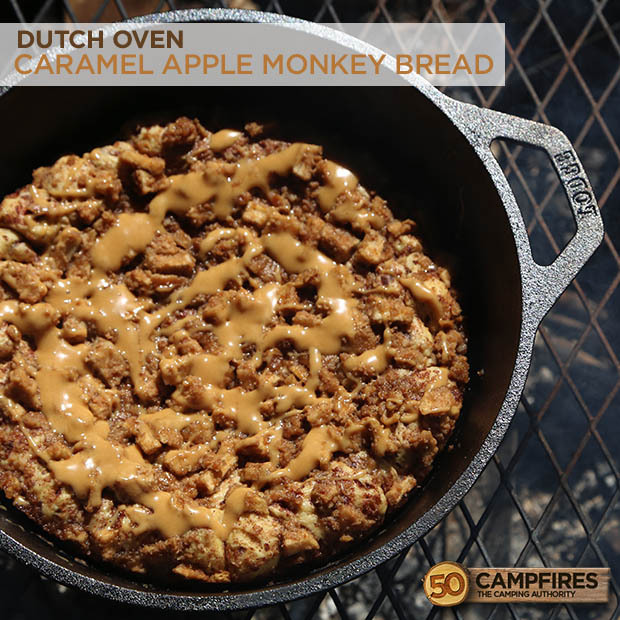 There’s everything from a Grilled Caramel Apple recipe and Crescent Roll Apple Dumplings to Barbecued Apple Crisp and even Dutch Oven Apple Pie! Mhmm good! And if you aren’t into making any even slightly time consuming recipes at the campsite, don’t stress! 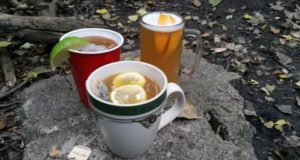 Most of these recipes have preparation steps you can easily do at home before you head to the campsite, saving you time and effort when you’re supposed to be relaxing in nature. Grab your tent, your Dutch oven, and head for the woods. And don’t forget the kids! Your little ones will have a blast helping with these quick and easy apple creations. We all know how amazing traditional s’mores can be around the fire, but there are other ways to enjoy our campfire go-to. This spin on a classic will definitely satisfy your sweet tooth with cinnamon, marshmallow, and chocolate-y goodness. Granny Smith apples are recommended for this recipe but feel free to use whatever apples you have on hand. Mix it up and send us the recipe if you discover something new! This spin on a classic will definitely satisfy your sweet tooth! Wash, core, and slice apples into circular slices. 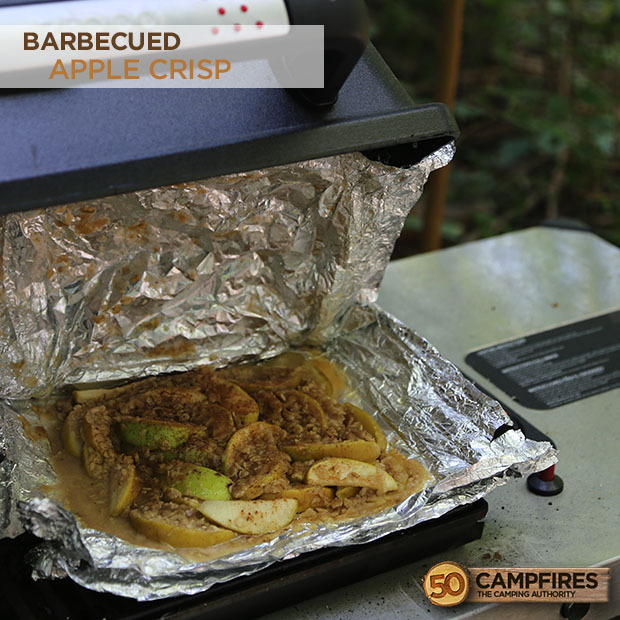 Place apple slices (layering them) onto a foil-grilling pan (or in a foil packet, if desired). Sprinkle apple slices with lemon juice. Cover apples with marshmallows and chocolate chips. Place grilling pan on the grill (low heat) for 10 minutes, or until marshmallows are golden brown and chocolate is soft. Remove and let cool for a few minutes. Sprinkle graham cracker crumbs across pan and eat up! Some people prefer to save deliciously crispy desserts for a special occasion – not us! This seasonal Barbecued Apple Crisp recipe can be your breakfast, lunch, or dinner (no judgment here). It’s a warm, flavorful treat that’s easy to make and really hard to share. This Barbecued Apple Crisp recipe can also be served a la mode with your favorite vanilla ice cream. Yum! This seasonal recipe can be your breakfast, lunch, or dinner (no judgment here). Preheat grill (unless using campfire) to a medium heat (about 350°F). In a bowl combine oats, flour, sugars, and cinnamon. Add 2 tablespoons of butter (small slices, one at a time) mixing until mixture is crumbly. Put bowl in fridge while preparing apples. Wash apples and pat dry. Toss apple slices with a squeeze of lemon juice. Cut two pieces of foil (about a foot each and in a square shape). Using the last 2 tablespoons of butter, spread evenly across the center of each piece of tinfoil. Dump the apples onto one of the pieces of foil. Sprinkle apples with the refrigerated crumble mixture. Place the top piece of foil (butter side down) on the apple mixture and fold the edges inwards (about a cm) one at a time, until the package is well sealed. Wrap the entire package in one more layer of tinfoil to help prevent the edges from burning. Place your foil pack on the grill or campfire for about 20 minutes. Let cool for a few minutes before opening, as contents will be very HOT. These fireside eats will be a hit on the next camping trip! 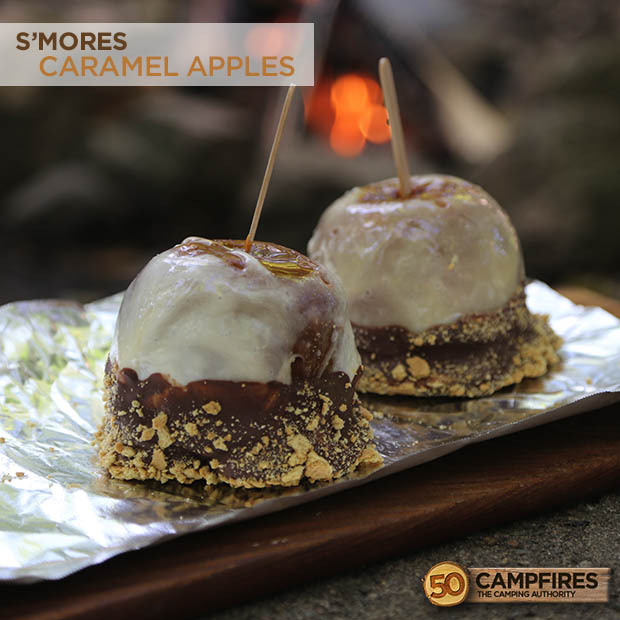 Simple and delicious, just roast your marshmallow and put an apple slice in the mix. Crunchy, caramel-y flavor for the whole crew to enjoy. Don’t have Granny Smith apples? Use whatever apples you have on hand. Chocolate sauce or other squeezable sweeteners can also be substituted for the caramel, if desired. Crunchy, caramel-y flavor for the whole crew to enjoy. Lay half of your graham crackers out. Top each graham cracker with one apple slice. Toast marshmallows on the fire to your desired doneness (we aimed for golden brown). Place one marshmallow on top of each graham cracker, apple combo. Finish by drizzling with caramel sauce (if desired, add another graham cracker on top to make a true s’mores sandwich). This recipe is about as easy as it gets, folks. You just pop the foil in the fire and forget about it (until your timer goes off, of course). What do you get? A baked, buttery apple with melted caramel and cinnamon sugar. Who’s hungry? The recommended serving size is one apple, so feel free to double or triple the recipe if you’re cooking for more than two people. Tip: You can also cut the apple into several slices and serve as a light dessert. A baked, buttery apple with melted caramel and cinnamon sugar. The recommended serving size is one apple, so feel free to double or triple the recipe if you’re cooking for more than two people. Tip: You can also cut the apple into several slices and serve as a light dessert. Cut two pieces of foil and layer one on top of the other. Cut off the top ¼ of the apple and set aside. Core the remaining apple and lay it on the center of the foil. Mix butter, sugar, and cinnamon together in a bowl. Pour caramel into the hole of the apple (you can add more caramel on the top as long as you don’t wrap it too tightly with foil.). Rub the butter mixture on both surfaces of the apple (top and bottom pieces). Seal the apple by bringing the four corners of the foil up over the top. 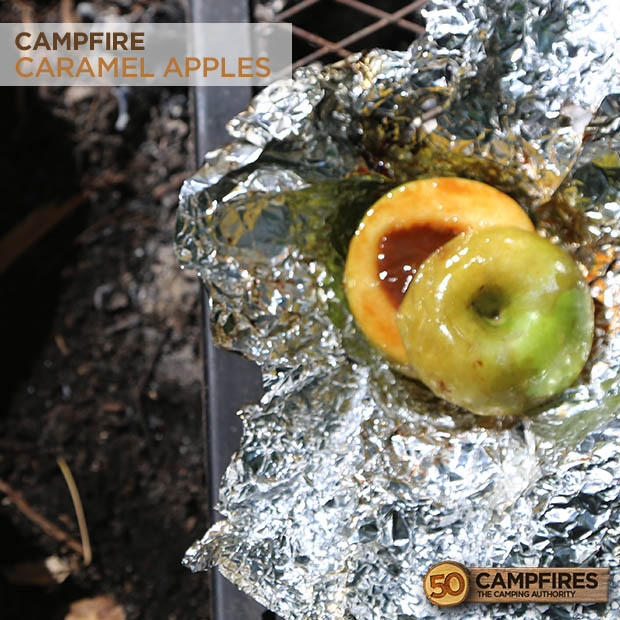 Set your desired amount of foiled apples around the edge of the campfire embers (away from flames) for 15-20 minutes. Turn the apples every 5-8 minutes. Check for doneness by squeezing gently with a hot pad or oven mitt. When your apple feels tender, it’s time to dig in! You may want to double up the ingredients, it’s that good. This is not your typical French toast recipe, unless your typical recipe involves sweet apple pie filling! Served warm, these yummy toasted rolls are the stuff dreams are made of. And why stop at apple pie? You can also substitute Nutella, jam, chutney, etc. for the bread filling. Use your imagination, you really can’t go wrong with this one. You may want to double up the ingredients, it’s that good! This is not your typical French toast recipe, unless your typical recipe involves sweet apple pie filling! Served warm, these yummy toasted rolls are the stuff dreams are made of. Use a rolling pin to flatten out each piece of bread. Spread as much apple pie filling as you can comfortably fit on all pieces of bread (we did about 2-3 tablespoons). Roll each piece of bread up tightly and set aside (seam-side down) while you finish the rest. Whisk eggs, milk, and vanilla together in a shallow bowl. Mix sugar with cinnamon on a small plate. Melt butter in skillet over the fire (medium heat). Dip each roll in the egg mixture (making sure to coat once completely). Begin placing rolls on the skillet, seam-side down. Cook rolls until all sides are golden brown. Remove cooked rolls from the pan and immediately roll on the cinnamon sugar coated plate (Note: If you are trying to cut back on sugar, you’ll want to coat very lightly). Serve plain or with syrup. Yum! 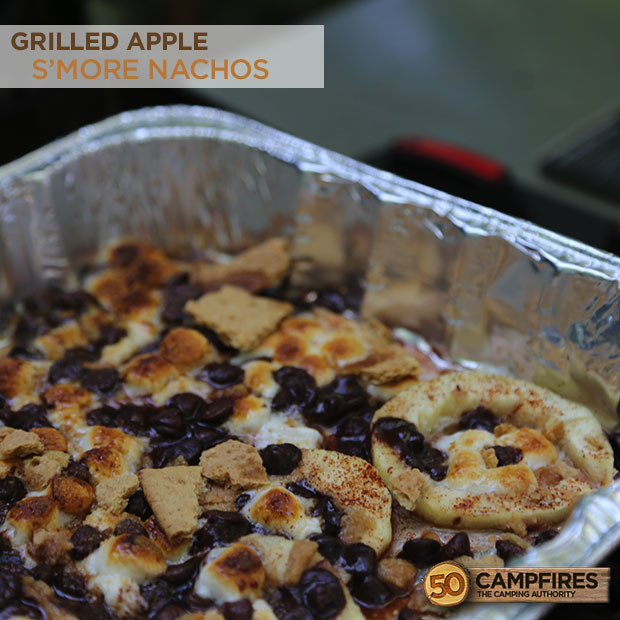 This yummy recipe will have your campers begging for s’more! 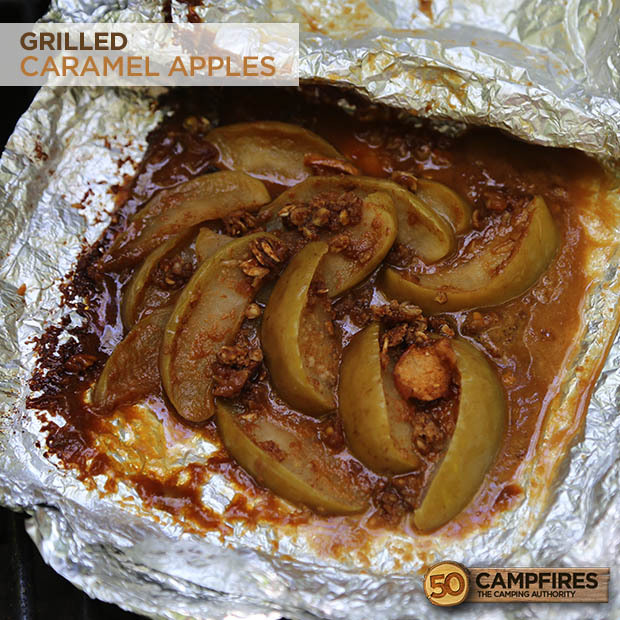 Yes, we realize this is not an ideal recipe to actually make at the campsite, as caramel apples require a bit more work, and a refrigerator, but we just had to include this recipe, because it’s ideal for people who love the outdoors! I mean a s’mores caramel apple? C’mon! There are a few extra steps for this caramel apple-on-a-stick, but if you put in the work, it’ll all be worth it. And who says you have to do the work alone? Kids will love helping you dunk each apple into the sweet melted sauces. Bring on those sticky fingers! Tip: This recipe can also be served as an appetizer, if you cut up the apples once the layers have all hardened. 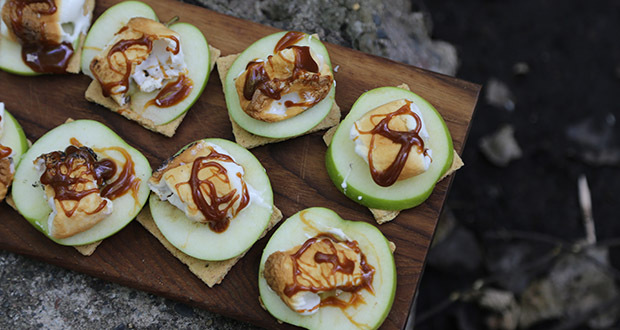 This yummy recipe will have your campers begging for s’more! Insert a popsicle stick (or twig) into the stem end of each apple. Cover a large plate with wax paper. Spray the wax paper with cooking spray and set aside. Melt the caramels by following the directions on the package. Dip apples into the melted caramel until evenly coated. Use a spoon to cover the tops of apples with caramel. Then place the apples on the plate. Refrigerate apples for one hour or place in freezer for about 15 minutes (or until caramel is dried). Once the caramel has hardened, melt the butter in a saucepan over low heat. Mix the marshmallows in and stir until completely melted. Dip the apples into the marshmallow mixture and then place on plate. Refrigerate for about 15 minutes (or until set). Once the marshmallow has set on the apple, dump the crushed graham crackers into a small bowl. Then melt the milk chocolate chips in a different container (according to package directions) and dip the apple in the chocolate. Now cover the chocolate portion of the apples with the crushed graham cracker bits. Put apples back on the plate and refrigerate until the chocolate hardens. Foil packs are the way to go for outdoor cooking – they’re easy to prep and require little clean up. Here’s another delectable fall treat to put in the rotation. 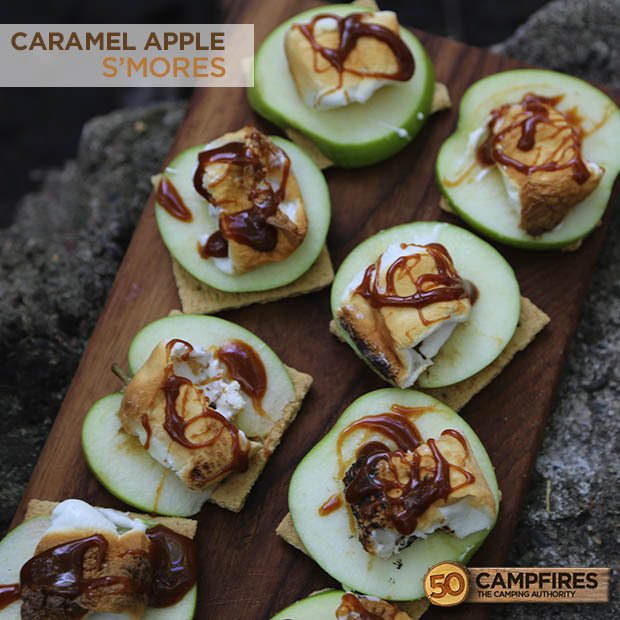 The flavor combos of caramel, apple, and cinnamon will blow your ever-loving mind! If you’re in the mood for grilled apples a la mode, serve it with your favorite vanilla ice cream and dig in! The flavor combos of caramel, apple, and cinnamon will blow your mind! Heat coals or gas grill for direct heat. Cut and fold four 18x12-inch pieces of heavy-duty aluminum foil (cross-wise, in half). Cover the center of 2 aluminum pieces lightly in butter, or with cooking spray. Cut apples in half, remove cores, and cut into 6 wedges. 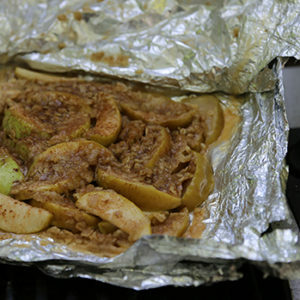 Place 6 apple wedges in the center of each buttered piece of foil. Drizzle 2-3 tablespoons of caramel topping over each cluster of apple wedges. Place the top pieces of foil (unbuttered pieces) on top of each cluster of apples. Wrap foil, folding the edges inwards, (about a cm) one at a time until the package is well sealed on all sides. Grill foil packets (seam-side up) 5 to 6 inches from medium-low heat for 8 to 10 minutes, or until apples are crisp and tender. Open packets, being very careful of steam. Caramel will be HOT. Is there anything better than warm cinnamon sugar apples wrapped in soft, flaky bread? We didn’t think so. 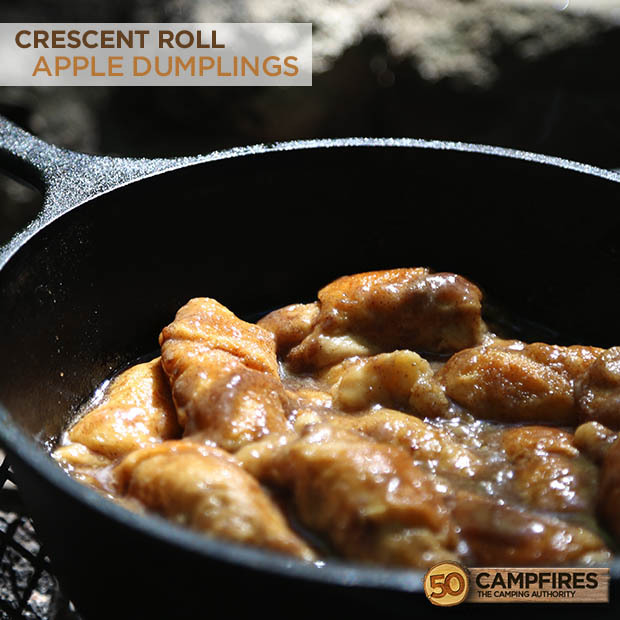 These deliciously sweet rolls are great for campground cooking, and the kiddos will be happy to help with assembly. This recipe takes very little time, even if you decide to double the ingredients. As with the other recipes, feel free to use whatever apples you have on hand. Who are we to judge? 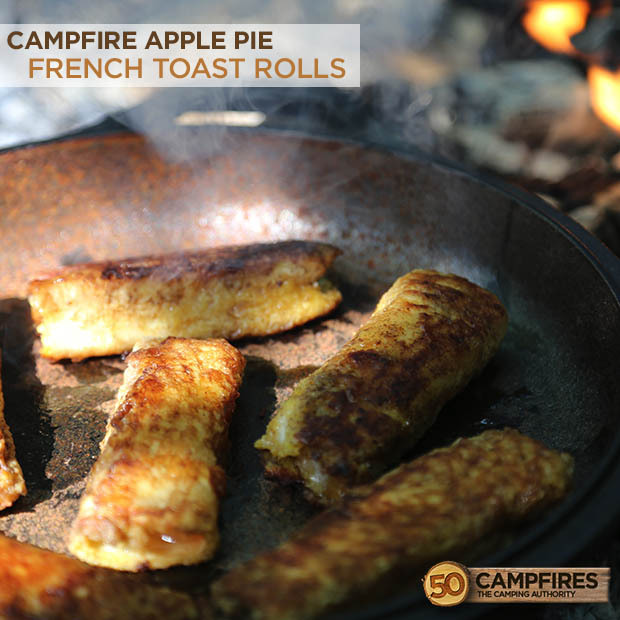 Deliciously sweet rolls, perfect for camp cooking! Wash, peel, and cut apples into eight equal slices. Unwrap the crescent roll dough and separate the triangles. Place one piece of apple on the wider end of each piece of dough and roll it into a croissant. Lay tinfoil or Dutch oven liner inside Dutch oven, lightly buttering the bottom. In a bowl, mix butter, cinnamon, sugar and vanilla until the mixture is liquefied with no lumps. Pour the mixture over the tops and sides of rolls. Pour 7 Up (or Mountain Dew) between the rolls (but not on top). Bake for 25-45 minutes, or until the rolls are golden brown. This seasonal monkey bread will have you feeling all the feels, after your first bite. Pull-apart sweet treats are so easy for camping, especially when the Dutch oven does all the work. Prep the food as you sip your morning coffee, and present the breakfast of champions to your half-awake squad. No nuts, no problem! 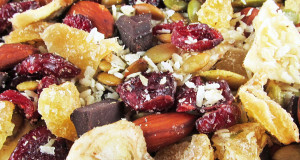 This yummy recipe is also great without nuts for campers with dietary restrictions. Pull-apart sweet treats are so easy and perfect for camping. Spray the bottom of a 12-inch Dutch oven with cooking spray. Cut each roll into four pieces and arrange in the bottom of the Dutch oven (lined with aluminum foil or a Dutch oven liner if desired). Cover with lid and let rise one to two hours. (Note: If you are using Anytime! Cinnamon Rolls you don’t need to let them rise). In a bowl combine apples, brown sugar, cinnamon, graham cracker crumbs, and nuts (optional). Remove lid from Dutch oven and sprinkle mixture evenly over cut rolls. Cover with lid and bake at 350°F for 30-35 minutes. Check oven after 30 minutes to see if the dough is done. Combine cream cheese frosting with caramel topping. Drizzle topping over pie while it’s still nice and warm.